LONDON — His Royal Highness The Prince of Wales hosted a historic Anglo-Armenian charity event in support of Armenian and British charities at Buckingham Palace on 15 June. 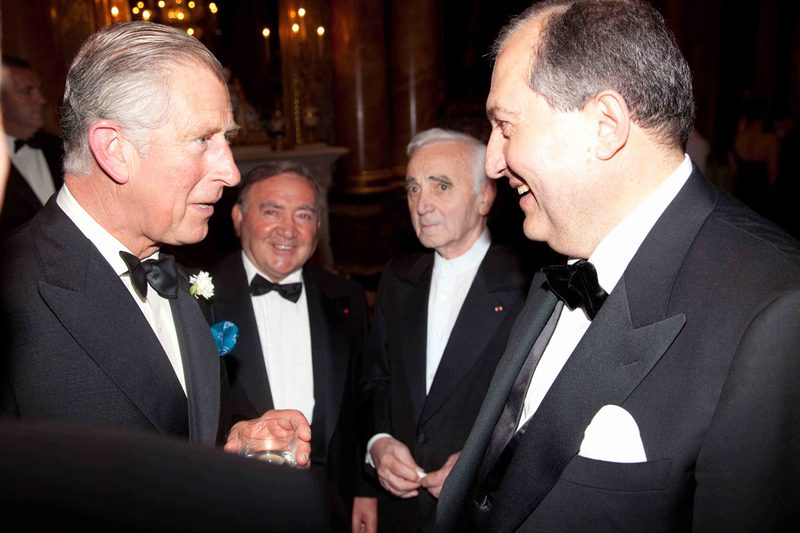 Project initiator and main benefactor Armen Sarkissian, former Prime Minister of Armenia and President of Eurasia House International, welcomed more than 250 guests from around the world with His Royal Highness. Members of the royal family, dignitaries, world renowned political, cultural and civic leaders, and senior executives of global corporations attended this unique charity event. Prime Minister of Armenia, Tigran Sargsian, and Mayor of Yerevan, Karen Karapetian were among the guests of honour. “It gives me the greatest pleasure to be able to welcome you all to this very special occasion at Buckingham Palace,” said the Prince of Wales in his remarks and expressed his thanks to all the donors of ‘Yerevan My Love’ and Dumfries House. The evening started with a reception, following by a unique concert especially put together on this occasion. World renowned soprano Renée Fleming and violin virtuoso and conductor Maxim Vengerov, took part in the programme, along with the Philharmonia Orchestra (London) and the Bach Choir. In addition to Handel, the choir sang most moving pieces from the Armenian liturgy, Surb, Surb and Hayr Mer by Makar Ekmalian. As a tribute to ‘Yerevan My Love’, Vengerov played Komitas’s Krung for the first time in his musical career, captivating the emotions of the audience. Renée Fleming enthralled the audience not only with her superb and mesmerizing voice, but also with her poignant remarks. A banquet followed in the magnificent Picture Gallery of the Palace. ‘Yerevan My Love’ is a heritage-led regeneration project dedicated to preserving architecturally significant buildings in Yerevan and putting them to use to improve the life experience of disabled children, young people and disadvantaged families. Following the successful fundraising in 2010, three buildings in the vicinity of St. Hovhanes Church in the Kond neighbourhood of Yerevan are being built and reconstructed. Three additional architecturally significant buildings will be reconstructed in the Old Yerevan neighbourhood as part of the second phase of ‘Yerevan My Love project,’ supported by the fundraising this year. Dumfries House is a unique house in South-West Scotland which had retained much of the furniture commissioned for it from Thomas Chippendale. A few years ago The Prince of Wales forestall the separate sales of the House and its contents to private bidders. He has since assured that the House and its unique collection of furniture are preserved for the British nation and future generations.